The official logo Karnataka Bulldozers 2017 has been launched and the kits of Karnataka Bulldozers for Celebrity Cricket League 2017 edition also released with the team’s jersey and uniform. The Karnataka Bulldozers team is defending champion as this team contain the biggest stars and deserved players which made this team a winner as well. 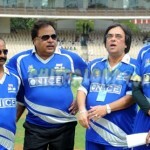 Karnataka Bulldozers’ kit is officially launched and new logo has been launched too. The shirt of this team contains blue and white color which is totally different with the previous kit. The shoulder of the shirt contains white color while there are white colored stripes on the sleeves of shirt. The upper left side of the shirt is having sponsor’s logo and right side contains the team’s official logo. The middle part of the shirt also contains the sponsor’s official logo. Trouser of the kit is having blue colored stripes on the sidebar as well. The kit of the Karnataka Bulldozers is the most liking uniform by the cricket and the celebrities fans which attract them a lot.